Arista had their IPO and is now valued at $3.4Billion or so. Most coverage has highlighted that Arista is competing with Cisco but really their products and strategy looks more like HP or Brocade. For the last 20 years, a “silicon moat” that has protected Cisco and other networking vendors from market competition. 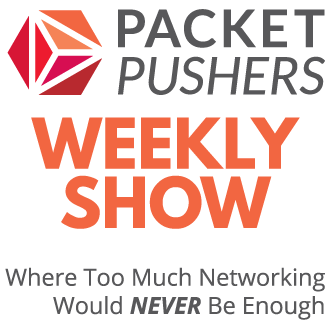 The cost, time and risk in designing and building the ASICs for networking equipment prevented market entrants and the result has been what is colloquially known “Cisco and the eight dwarves”. Arista has taken merchant silicon,open source software and modern software development methodologies and built a hardware product that competes equally with the top networking vendors. The value is not in the hardware but in the software that drives it. 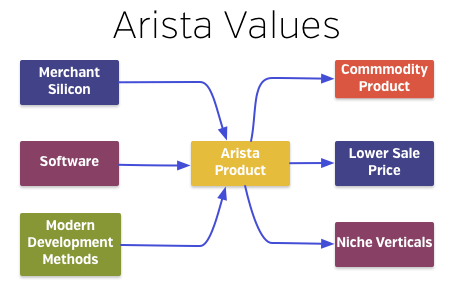 Here is how I see Merchant Silicon fitting into the Arista value chain. At this point, Arista has had good traction in the data centre and especially with financial organisation in the trading floors. Arista was able to use its rapid software pipeline to add features to the EOS operating system that addressed the transactional market in HFT. When Microsoft came calling with a BGP SDN requirement, Arista leveraged EOS and rapid development to add features to win major revenue (22% of company sales according to IPO documents or $80 MM) and a signature customer. Arista has resisted customer pressure to add features. EOS implements features that solve core networking problems and, so far, Arista has been measured in adding features. Code bloat will lead to the same problems that Cisco IOS faces in terms cost, service overheads and most importantly, reliability. Today Arista is continuing with chassis-centric product strategy which is a differentiator to whitebox Ethernet. Chassis products are complex to design and customers are less likely to regard them as consumable items. As hardware, the Arista product range is comparable to any competitors. While there are differences, there is no specific weaknesses. Arista has many growth options outside of the data centre. The most likely destination is to carrier/service provider via NFV technology because the EOS architecture is well suited to integration with OpenStack and other cloud orchestration tools. The rapid development cycle of EOS can provide the momentum to bypass incumbents at the edge of the carrier network. merchant silicon enables many companies to innovate on hardware on a similar basis to Arista. Broadcom has it’s own operating system and companies like Facebook are building their own hardware and software. This shrinks the available market. 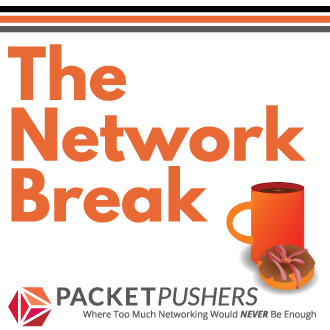 Ethernet Chassis products are becoming less relevant outside of scale network as new ECMP technologies in 1RU switches mature. Virtualization means that total ports are 1/10th of what 1GbE port sales were previously. Companies like Nutanix and VCE have proved that there is demand for converged infrastructure. The network is no longer separate from servers and storage. shrinks the addressable market and prevent entry to some markets. to date, Arista involvements in OpenStack and Opendaylight is limited with few partnerships in this space.